While shopping in a Knoxville Supermarket, a smiling, personable clerk came up to Haley, grasped his hand and mentioned that he was learning to read. The coincidence struck Haley as remarkable, since PARADE had just asked him to write an article on the subject. The young man, who identified himself as Joseph Rivera, said he’d bluffed his way through high school until he finally dropped out to work full-time because he saw no pressing need for reading or writing. 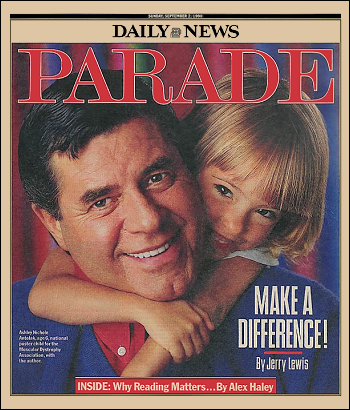 The coincidence struck me as remarkable, since PARADE had just asked me to write an article about the critical nationwide need for a higher level of literacy and reading. The obviously capable Mr. Rivera was an immediate and forceful symbol of what can happen when a young person fails to learn to read—and, fortunately, he also symbolizes how those in need can take themselves in hand and do something about it. We talked a little more, then bade each other goodbye. I was fascinated by our conversation, and intrigued. There were a few more things I wanted to ask him. Several nonprofit organizations develop and establish programs to overcome illiteracy. They also train volunteers to tutor adults and young people. Two leading organizations are Literacy Volunteers of America and Laubach Literacy Action, both based in Syracuse, N.Y. And the First Lady heads The Barbara Bush Foundation for Family Literacy, which identifies successful programs, awards grants and supports training for teachers. In addition, many newspapers across the country support literacy programs. In 1988, more than half the Fortune 500 companies offered literacy programs to their employees. The most important thing to recognize, as these programs teach us, is that the person we are talking about might very well be living right next door. And I believe that, by helping him or her, we help ourselves. Much also is being done in public libraries across the country to awaken the joys of reading for individuals like Joseph Rivera. In Harrisburg recently, I visited the “Propelling Reading” program developed by the Dauphin County, Pa, library system. This is clearly one of America’s outstanding models of how first-graders are “propelled” into a love of books and reading. Richard A. Bowra, director of the Dauphin County library system, noted that every first-grade classroom in the program contains a shelf of specially selected books, and that teachers, parents, older students and school library staffers read aloud to the first-graders every day. “We’ve found that our vital link to our program’s success is the immediate presence of the books in the classrooms,” said Bowra. “Also we publish tips for parents about new books, and we have family-reading nights.” The program has achieved such success, he said, that one of the nine branches has increased in use seven times since it was built in 1976. Another major success is in Fairfax County, Va., whose first library was a bookmobile that roamed the streets in 1939. That system today has 22 branches, a $19.7 million budget for 1991 and plans to build or expand 11 libraries. In some young people’s departments, the libraries offer special attractions such as resident gerbils. These unusual enticements evoke a warmth in me because they lead me to recall how my parents and grandparents came along with something different on the occasion of my fourth birthday in my dusty little cotton-farms hometown of Henning, Tenn. Sixty years later, I still remember vividly how they presented me with a foot-thick slice from a big California redwood tree. Small white markers were stuck in it at different places. With our family all solemnly gathered, my father used a pointer to illustrate how the tree’s growth rings had come one each year, that each white marker represented some event, and the markers were situated at points corresponding to those years in the growth of the tree. I was told that, if I’d read all I could, whenever I found something notably historic, then that could become another marker in my slice of tree. From then on, I read every book I could handle, along with my grandpa’s newspapers for black people, which came by mail. Today, I absolutely believe that the reading inspired by the tree slice greatly influenced my becoming an author. It is also why I like most of all to write about historical subjects. Those questions I had in mind about Joseph Rivera continued to tug at me, and finally I returned to the supermarket. I wanted to know more about how he had reached adulthood actually unable to read and what his life had been like as a result. We went to breakfast with his wife and baby daughter. As I listened during our breakfast, Rivera told me the story of illiteracy far more vividly than all the statistics I’d read. “My mind was on hustling for some spending money when I started school,” Rivera said. “I’d stick a book up before my face or make pencil marks on a tablet to look like I was reading or writing, and when I got too big to be in that class, the teachers would pass me on. “All the time, I was learning many ways to bluff it, so nobody would know I couldn’t read or write. One good result was I learned to listen very closely to what other people said, because that fed me with clues to help me cover up if somebody asked me something. Maybe it might involve something printed on paper. Well, I’d glance at it real fast before I’d say, ‘Yeah, right!’ By this time, I’d learned I had to be real careful whom I’d let know I couldn’t read, because plenty of people reacted as if you were afflicted with some catching disease. “But by now I’d learned to fake. For example, if I took a date to a restaurant, always I’d order for myself something I knew they had, like maybe the original New Orleans Po’ Boy sandwich, which is fried oysters between French bread. “Working in a warehouse, if somebody handed me an order list, well, at least I knew my ABCs enough that I could carefully compare the letters on the list and match them up with the letter on a box in the warehouse. It was around age 22 that he and Angela got married, Rivera said. She was from Knoxville, she worked for a music company, she could read like a whiz and she thought he was teasing when he told her he couldn’t read. “Then I took a job at the Schwegmann supermarket,” he went on. “After a while I rose to assistant floor supervisor. Then they next offered me a chance to train to be a store manager. Man, I could taste having that position, but I knew that every day a manager had to be reading all different kinds of stuff. My heart ached, I wanted that position so bad. But I told them I didn’t feel I was ready yet. “The company’s officials knew something was wrong. Of course I could tell that, you know, from how they looked and acted when they happened to be anywhere around me. And that’s about when I started coming home, real uptight and upset, and I’d holler at Angela. Finally, they ended up going to a teachers’ supply house and got a cassette and a book. Rivera paused. “At least that got me seriously started.” He looked across the table at Angela, who was holding their daughter of 8 months, Maria. Then I handed it to Rivera. Such were the messages we both felt to be conveyed, such were the significances—about the great meanings and values of literacy, and of reading—that he and I both quite openly had moist eyes. ~ Alex Haley.